The last full day on our short family vacation we went whale watching with Vancouver Whale Watch out of Richmond, BC. There were about 40 folks in our zodiac boat and we traveled out into the Strait of Georgia and among the islands. We were lucky enough to see the J Pod of Orcas, including Granny (who maybe upwards of 100 years old) and several babies. They swam near our boat for upward of an hour. They surfaced and slapped and spyhopped. It was Vancouver Whale Watch’s 104th consecutive days of orca sightings of those they went out. At the end of our time three large ferry boats came into view and the pod frolicked in the foreground. What a perfect scene! We also saw a young eagle and seals lounging about. 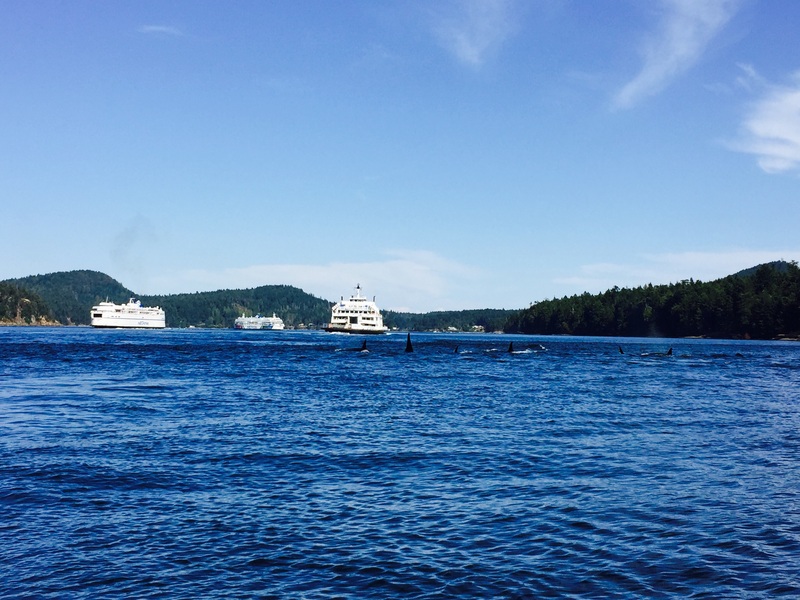 This entry was posted in Uncategorized and tagged babies, eagle, Granny, J Pod, orca, orcas, Richmond, seal, seals, Strait of Georgia, tour, Vancouver, Vancouver Whale Watching, whale, whales, zodiac boat on July 28, 2015 by admin.